Apple has hired veteran Washington insider Amber Cottle as its new top lobbyist according to a report from Politico. Cottle was previously the Democratic Staff Director for the Senate Finance Committee, where she also had experience as the committee's Chief International Trade Counsel, important experience for Apple's needs on Capitol Hill. 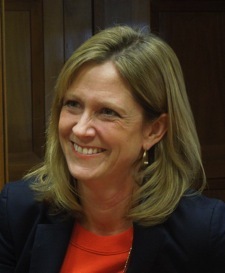 In her job on the Finance Committee, Cottle advised members and staff on trade and international economic issues, and was previously Deputy Assistant U.S. Trade Representative for Investment. Apple has been increasingly active in Washington DC in recent years, with Apple executives meeting with President Obama over NSA surveillance and appearing in front of a Senate committee to discuss Apple's tax strategies. The company has repeatedly asked Congress for a discount on taxes for repatriating cash earned overseas to the United States. The company began looking for a new VP of Worldwide Government Affairs when Catherine Ann Novelli, who held the position since 2007, left for a job at the U.S. State Department. According to Politico, Apple spent $3.3 million on lobbying in 2013, roughly double the previous year. Tim cook hired a Democrat? That's some real news. Just another corporation buying another lobbyist to buy another politician.... Nothing else to see here... move along please. Am I the only one who feels the world would be a better place if we just went scorched earth on DC? So many leaches on society would just go up in smoke. How come this isn't in with the political threads? It's not even a story, really. At least it's not another thread about bird games. Hey ARN, macbirdrumors.com is still available! While I enjoy your stereotype and roll my eyes at you...It's actually a smart move to hire a well networked Dem. She's well connected with the few Dems left who actually care about jobs, regulations and tax revenue on-shore. Who better to try to convince them Apple's way isn't quite like those other corporations ways. She looks very angry to be ing this article. I know! When women are successful and smile in a picture...I get jealous too! I have to disagree with you on this point. Lobbyists are a necessary part of this system because it provides the representatives of this government with a better understanding of the constituency and also provides for a better form of legislation. Or, more realistically, lobbyists provide the representatives a misleading understanding of the constituency to provide a biased form of legislation. Take a trip to your state capitol and attend some of the committee meetings on bills that impact things that you understand. Then listen to the lobbyists giving testimony. If you really understand the issue or actually research the claims, you will be amazed at a) how blatantly misleading they are, either by omission or outright falsehoods, and b) the gullibility of the legislators who swallow it hook, line, and sinker. I just did this last week. It is ridiculous, and exceptionally disheartening. Oh, but just so I'm not completely down on democracy, let me urge you to click on the political links that allow you to sign a petition or send a message to your lawmaker. Crowd actions like this can actually make a difference, really acting as a balance to the lobbyists. I've seen them work firsthand. it's a sad state of affairs that a company needs lobbyists.